I am writing this in Amanda's kitchen in Boston. There is ivy growing over the windows (in the bathroom the ivy has actual grown through the windows and grown into the shower in a magical mixup of indoors and outdoors) and all the light is very green. I've been making a list of important things to blog, and then forgetting to do it, mostly because nothing has been more important than grabbing a handful of days with my wife, and when I've had downtime I've been making up things and writing them down and not blogging. I will try and get the most important things down here today. I joined Google+ and decided that I didn't want another public platform yet. I like Twitter. I tolerate Facebook. Google+ seemed (for me) like an awkward mash-up of the two. I found the continual stream of notifications telling me that another 500 people I did not know had put me into circles and that lots of other people I didn't know had mentioned me really irritating and distracting, and I couldn't turn them off or easily find the signal in the noise (or find my friends in the flood of people putting me into circles), and when I grumbled about it mildly (agreeing with Warren Ellis that I couldn't find friends I'd actually want to put in circles among the thousands of people who I was being told were putting me in circles) a couple of hundred people explained to me that I was Doing It Wrong. It was the "You're Doing It Wrong" messages that were my personal tipping point. As far as I'm concerned, the mark of a good social network is that it either does what it was made to do easily and cleanly, or it's bendy enough that you can make it do what you want. And being told "you're trying to use it like Facebook but really it's like Twitter!" just made me strangely nostalgic for Twitter. And as Twitter was still there, I cancelled my Google+ account, feeling at this point that I didn't need another time sink, another place to check, another distraction from work or from life. Anyway, I wish Google+ all the best. I'll probably check it out again in a year or so, if I'm still on the Internet, or sooner than that if they make things so I can't blog without it. And it may well be an excellent Social Network eventually. It's still in Beta, after all, and most users aren't going to get a huge instant flood of followers (circlers?). So that's a social network I said goodbye to. I said hello to Turntable.fm, however, a service (currently US only, alas) that lets you make a room, or join a room, and DJ in it. You and four other people can DJ at a time, sharing music you've taken from Turntable's extensive databases or uploaded. I loved DJing, especially once I decided that there should be more spoken-word stuff out there, and that people might like it, and created http://turntable.fm/neilhimselfs_house_of_poetry and have slipped in there from time to time and just played poetry, and been delighted as other people DJ poetry too. Chris and I talk about Craig Ferguson and late night chat shows. We talk about Doctor Who. We talk about John Hodgman and his unique worldview and his scary moustache. And at the end we talk about writing and how to write. It's really good, I think. Last Sunday I drove down to Madison to make an unannounced and I hope relatively unexpected appearance at the Discworld Convention. 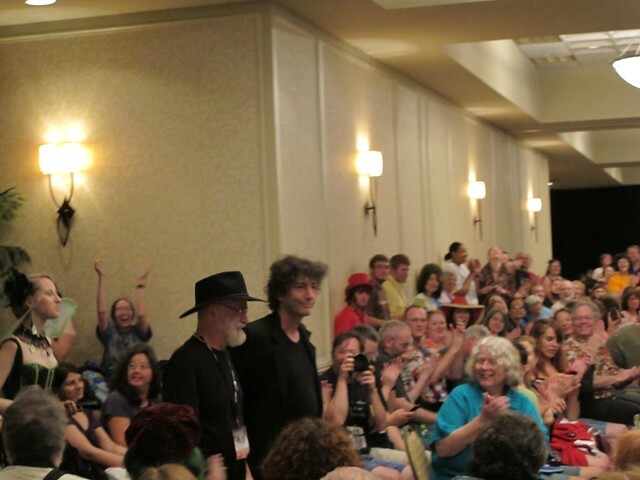 I got to talk with Terry Pratchett for almost two hours on a stage about GOOD OMENS. 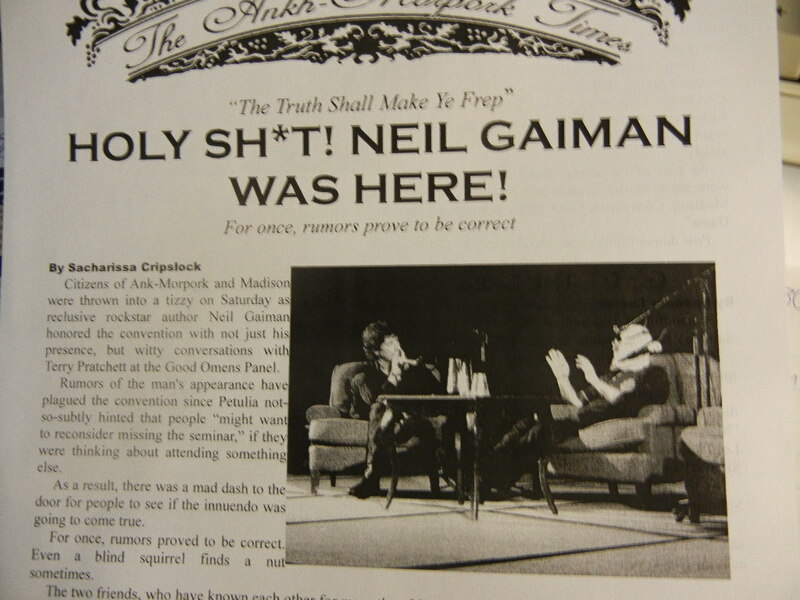 This was really an excuse for me to spend time with Terry before, during and after the panel, but that also meant that the conversation and the limited time we had together made the Good Omens panel much more "real" (in every sense) than normal panels. We weren't pulling out well-honed anecdotes or trying to make the audience happy. We were just two old friends chatting about something we made over twenty years ago, and reminding each other of bits of things that had happened that we'd forgotten. Also we sang They Might Be Giants' song "Shoehorn With Teeth" together and remembered most of the words. And a photo of Terry, me and winged Emily Whitten (chair of the NADWcon). I am pointing to her impressive tights. 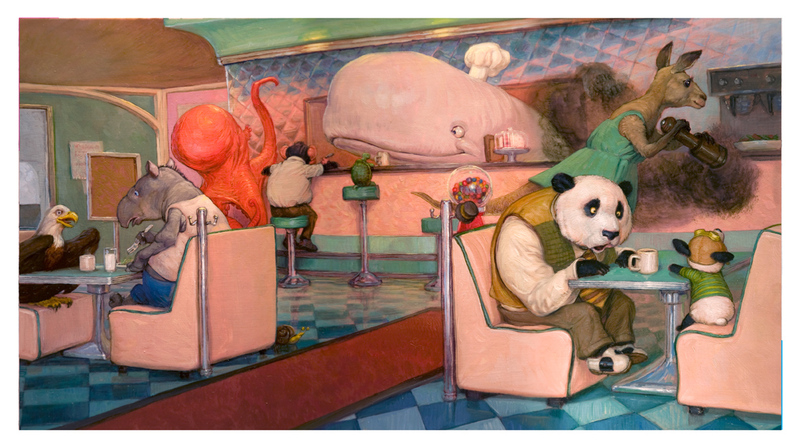 I am astonishingly proud of a book I wrote that Adam Rex is currently painting, intended for very young readers indeed. You can find out about it at Adam's blog http://adamrex.blogspot.com/search/label/chu. Here's the first finished picture from it, set in the Moby Diner. Our hero is in the bottom right-hand corner with his back to us. And finally, I just got this from J. Michael Straczynski... he's put the text up on his Facebook page, but I'm cutting and pasting it here, with his permission, so there's somewhere outside of Facebook that people can link to and learn about it and sign up for the book before they're all gone. I don’t have to tell you who Harlan Ellison is, or that he wrote some of the most seminal episodes of science fiction television in the history of the form. His scripts for The Outer Limits, Star Trek, Twilight Zone and others have won countless awards and are considered landmarks of the genre. A while back, I got wind of a top-secret project being developed by Publishing 180, the company that publishes the Babylon 5 script books, involving Harlan’s scripts for these series. (Important note: I do not own any part of P180 nor do I receive any financial remuneration of any kind from this project. My involvement here is strictly as a fan and admirer.) I now hold in my hand a preliminary copy of that book, and I wanted to give everyone a heads-up because folks, this is a doozy. In many cases, the book contains both the script and the treatment for the script, something almost never seen outside the studio. Most amazing of all, the book contains not just the shooting script for Harlan’s HITCHCOCK episode, it contains an earlier draft filled with his handwritten annotations and changes. When an episode is broadcast, you don’t get to see the writer’s mind at work, don’t have the opportunity to experience the moment he decided to make a line of dialogue or a scene go thisway instead of thatway, how a turn of phrase was altered in just the right way at the last moment, you see only the end product. By including the draft with the handwritten annotations, you can see the creative process being enacted right before your eyes. The opportunity to see inside the writer’s mind is unspeakably rare. Best of all, these are not re-typeset versions of the script, they are painstakingly scanned reproductions of the ORIGINAL SCRIPTS, exactly as they were written. And for the budding science fiction writers out there, what better than having Harlan Ellison break down in his manifesto how to write effectively in the genre, how to avoid various kinds of traps and make your writing better? The value of this book to up-and-coming writers, academics, collectors, fans, and just plain folks who love science fiction television is inestimable. This isn’t just a book of scripts, it’s an important piece of history. When I heard that Harlan was going to include the B5 manifesto (entitled “A Terrifying List of Things Not to Do When Writing For Babylon 5”), I offered to write an introduction to the volume, entitled “Touching Magic.” That introduction is now also in the book. Last, and maybe coolest of all, because of the presence of B5 material, they are doing a limited number of books that are DUAL AUTOGRAPHED by both myself and Harlan. With only one prior exception, this is the ONLY time that Harlan and I have autographed something together, and never before for a published book. Once those signed editions are gone...they’re gone. Because Publishing 180 is a boutique publisher, they do not generally release information on its upcoming titles until right before publication. But this volume is so important, so extraordinary, that I asked if I could give the B5 fans out there, and the fans of Harlan Ellison who are also in that group, a heads-up on this event. This way we reduce the risk of missing the chance to get one of the double-signed editions. And I just realised that I did not get everything down here. There appears to be a new, currently nameless, cat living at my house. I will tell you the story next blog. 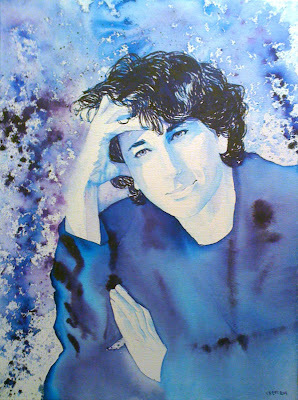 And I almost forgot, for those who made it this far - artist Steve Cleff has done a portrait of me as a benefit for the CBLDF. The auction has a few hours to go. Here is the link.